Later known as Quill. Tamworth member from Grendon, Phil Bates (lead guitar) a later member of Trickster and ELO. 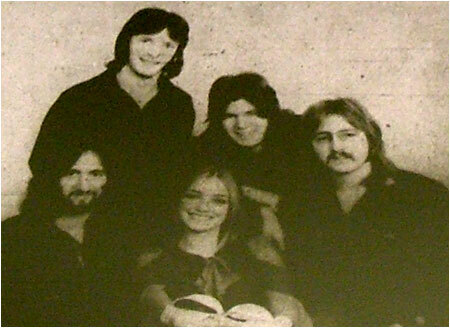 Dosthill’s guitarist Phil Bates has, together with his band “Kwil” released their first single on the Parlophone label. “Spent the Rent” is the ‘A’ side number and it has received about 20 plays on Radio One. Phil plays bass and contributes to the vocal harmony. The unusual combination of violin and ukelele contributes to the special sound that Kwil are establishing. Hit Parade success is always a difficult business but this record could do well if it gets enough exposure. The ‘B’ side is another Tony Rose number called “Every Little Thing” and this is also as pleasant song which has a good dancing beat. On Wednesday, Kwil were in London recording their next single which is due for release after Christmas. A Phil Bates composition, “Wouldn’t It Be Nice” will be featured on this one. Members of Tamworth’s night spot, Susanna’s will be familiar with the group, as they played there recently. On Friday, Kwil start a club season in the north, but they will be back in the Midlands in mid-November. Local favourites Kwil have released their second single and it is in the shops now. The song has been penned by drummer Gill Sowell and is entitled “The Stripper”. After a spell of rest Kwil are now back in action. They played on the Kenny Ball bill for Tamworth Round Table last Saturday and are next in the area at Drayton Manor on Friday April 4. Dosthill singer/songwriter Billy Bates will soon be having a song released on the Spark label and the act for whom the song was written will be appearing on television. The children’s act Bengy the Bear and Rumpo the Rabbit will be appearing on New Faces backed by Billy and the Terry Lightfoot Band – who will be playing “We Love Bengy” Words and music by Billy Bates. Returning to his serious career Billy has just finished his mater recording of his second single which is dues for release in the early summer. The full profile and history of Kwil has yet to be added to TamworthBands.com Call back soon to read the full band details.